Petty cash is a small amount of cash or discretionary funds reserved for small expenses that couldn’t be disbursed through any cheque, because of different reasons, including costs of writing, cashing and signing. The imprest system is used for the accounting of petty cash. To get initial funds, a cheque for the desired amount is issued and typically $100 is enough for the small business needs. The petty cash will be debited in the bookkeeping while crediting bank account. A sheet should be designed to have complete records and transactions, and this sheet will be designed easily with the help of the given template. The petty cash handling and its recording both are equally important and the template is perfect for your help. How can the template be useful? If you are bothersome with complex cash sheets to have records of all transactions, then try this template to have a simple sheet. It will be good to have something easy to use for your staff and make your cross checking also easy. 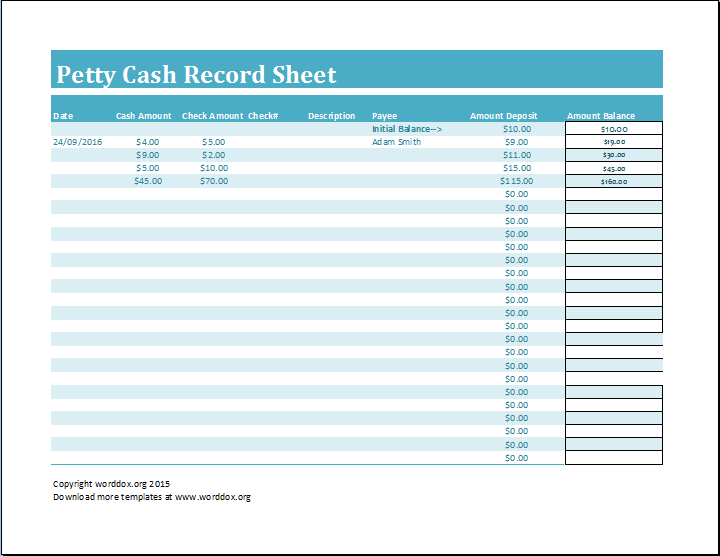 You can use the petty cash template to design a simple and convenient solution. There is no need to worry about different vouchers of petty expenses because the template enables you to record each and every petty cash transaction. It will diminish all problems from your life, and make it easy for you to maintain a solid record for the best record keeping. The template is absolutely free, and you can make changes in the contents of the template because it is designed for your convenience only.